Chelsea striker Didier Drogba has admitted he dreams of playing for Milan and that he has held talks with the Italian giants. 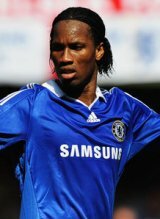 Drogba has been strongly linked with a move away from Stamford Bridge for a number of months and the Ivorian has now revealed that he met with Milan at the start of last season. The 30-year-old, who could make his final appearance for Chelsea in next week’s UEFA Champions League final against Manchester United, has confessed to flying to Italy in August 2006 to talk with veteran Milan defender Paolo Maldini and the club’s vice-president Adriano Galliani. "All footballers dream of signing for Milan." said Drogba - who joined Chelsea from Marseille for £24million in 2004 - in extracts from his autobiography quoted in The Sun. "I explained to Paolo Maldini that Milan is a club I would love to join." And Drogba replied: "Whenever you want, it’s all up to you - get the money ready and go see Chelsea." Drogba has also disclosed that he informed ex-Chelsea boss Jose Mourinho -who was in charge of the Blues at the time - that he was going to the dentist in Paris, but the appointment was cancelled and he travelled to Milan instead. And according to Drogba, when Mourinho found out about the discussions with Milan he blasted the forward over the telephone and forced him to train with Chelsea’s reserves. Transfer Drogba added: "Jose took the phone and put it on loud speaker and said, ’OK, seeing as we are not kids we are going to talk. ’I trusted you - I’ve done everything for you and there you are telling me you’re going to the dentist in Paris when in fact you’re in Milan talking over your transfer. ’You lied to me. You didn’t keep your word. Have you been badly brought up or what?’"